One of the few major flutes which has reached us in very good conditon and complete (also case). We like to make the complete copy with the 4 centers (A 392, A 405, A 415 and love center in B A 415). The register foot is added to tune exactly the D.
The low A 392 center is probably the chamber pitch, the A 415 the church pitch. They surprisingly speak equally even good, for instance A 392 for Bach in the Partita and A 415 for Bach Sonatas with harpsichord. 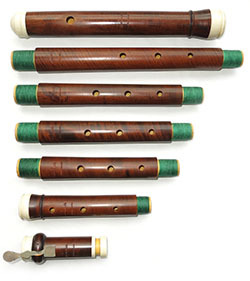 Jacob Denner is the reference for the recorder makers and according to us, for the traverso too.